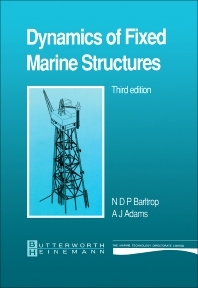 Dynamics of Fixed Marine Structures, Third Edition proves guidance on the dynamic design of fixed structures subject to wave and current action. The text is an update of the ""UR8"" design guide ""Dynamics of Marine Structures"" with discussion of foundations, wind turbulence, offshore installations, earthquakes, and strength and fatigue. The book employs analytical methods of static and dynamic structural analysis techniques, particularly the statistical and spectral methods when applied to loading and in the calculating dynamic responses. The statistical methods are explained when used to wave, wind, and earthquake calculations, together with the problems encountered in actual applications. Of importance to fixed offshore platforms are the soil properties and foundation covering soil behavior, site investigation, testing, seabed stability, gravity structures, and the use of single piles. Methods of forecasting, measuring, and modeling of waves and currents are also presented in offshore structure construction. Basic hydrodynamics is explained in understanding wave theory, and some description is given to forecasting of environmental conditions that will affect the structures. The effects of vortex-induced vibrations on the structure are explained, and the three methods that can prevent vortex-induced oscillations are given. Wind turbulence or wind loads are analyzed against short natural period or long natural periods of structures. The transportation of offshore platforms, installation, and pile driving, including examples of the applications found in the book, are given as well. The guide is helpful for offshore engineers, designers of inshore jetties, clients needing design and analysis work, specialists related to offshore structural engineering, and students in offshore engineering. 5.4.3 Sand waves, dunes, banks, etc.